Ex-Lotus Racing reserve driver Fairuz Fauzy has joined Lotus-backed Formula 1 rivals Renault in the same role. Renault said the Malaysian, 28, will also compete in the GP2 series with the Super Nova team in a car carrying branding for Lotus owners Proton. "It's a real honour to be part of a top team that has achieved so much in the sport," said Fauzy in a statement. 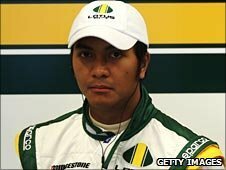 Fauzy's former and new teams are locked in a legal dispute over who has the right to use the Lotus name in F1. Lotus Racing, owned by Malaysian aviation entrepreneur Tony Fernandes, have been renamed Team Lotus for 2011 after ending their debut season as the best of F1's three new outfits. Proton-owned Lotus Group have meanwhile arrived as title sponsors and significant stakeholders in former world champions Renault. Fernandes is in dispute with the Lotus Group, which claims it has the sole rights to race as Lotus in F1. The case is set to be heard in the High Court on Monday, 24 January. However, the dispute does not concern Fauruz, who added: "It feels especially exciting [to join Renault] because of [their] new partnership with Lotus, and I'm very proud to be here at the start of a new era for the team. "It's also a great opportunity for me to improve as a driver and learn as much as I can about Formula 1 so that, hopefully one day, I can be on the grid myself."